Intensive dryer with varnish preserver. Highly effective drying aid with innovative luster. Guaranteed fast and problem-free drying by spontaneous and large-area elevation, even in problem areas with a small tear zone and / or high belt speed. Very suitable for biological water treatment plants. 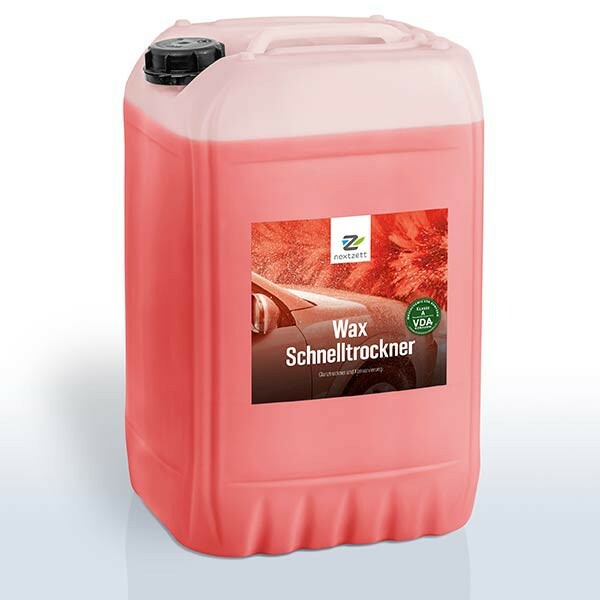 nextzett- Wax flash dryer is a highly effective drying agent based on cationic and non-ionic surfactants and guaranteed by its high-quality care components for quick and easy drying with innovative brilliance in all automatic car washes and self-service boxes. nextzett - Wax quick-drying should be applied no pressure on already washed vehicles to ensure optimum performance. After 2-1.Js ec the water relaxes and the surface of the water rips spontaneously and large area. As a result, the formation of microbeads is also minimized in problem areas (such as a short tear zone, high belt speed, industrial water). The use of polymeric care components gives an improved long-term effect as well as a visible increase in gloss. nextzett - Wax flash dryer has its best effect at a final dilution 0.15 to 0.25 % . Overdose does not improve the drying . For dosing pumps 15-25 ml per passenger car.